Japanese Prime Minister Shinzo Abe attends a press conference in Doha on August 28, 2013. Abe has promised the world his government will play a greater role in stopping leaks of highly radioactive water at Fukushima. Japanese Prime Minister Shinzo Abe has promised the world his government will play a greater role in stopping leaks of highly radioactive water at Fukushima. Wrapping up a tour of Africa and the Middle East, Abe said in Qatar Wednesday that the issue at the crippled Fukushima Daiichi plant cannot be dealt with by operator Tokyo Electric Power (TEPCO) alone. "The accident in Fukushima cannot be left entirely to Tokyo Electric Power. There is a need for the government to play a role with a sense of urgency, including taking measures to deal with the waste water," Abe told a news conference. 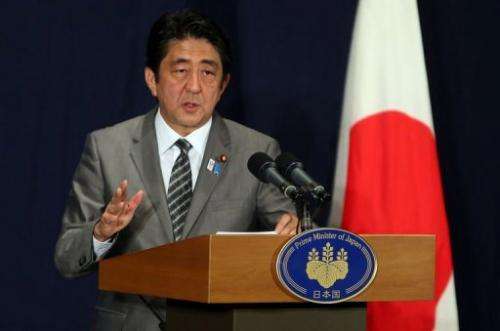 His industry minister and Japan's head nuclear regulator have been tasked with finding the cause of the leaks and drafting steps to counter the problem, Abe said. "The government will make responsible efforts to address the matter, and clearly and promptly inform the domestic and international communities," he added. Abe's pledge came as the world's nuclear watchdog urged Japan to explain more clearly what is happening at Fukushima and avoid sending "confusing messages" about the disaster. The International Atomic Energy Agency questioned why the leak last week of 300 tonnes of highly radioactive water merited a rating on its International Nuclear Event Scale (INES), when no other incident since the March 2011 meltdowns had. The IAEA cautioned against the frequent use of INES evaluations in the future, saying this risked clouding the issue in the public mind. 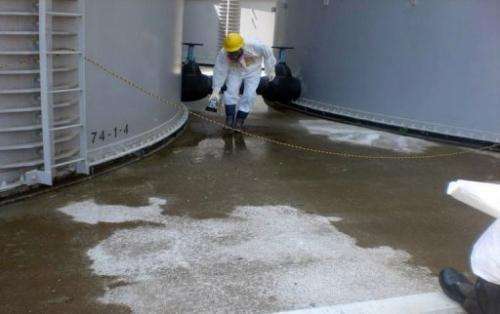 The storage tanks for radioactive water at Japan's crippled Fukushima nuclear power plant. Local regulators on Wednesday rubber-stamped their earlier assessment of the huge spill, in which one of around 1,000 tanks at the site was found to be holed, as being INES Level 3. That made it the single most serious incident since three reactors went into meltdown after being swamped by the earthquake-sparked tsunami. 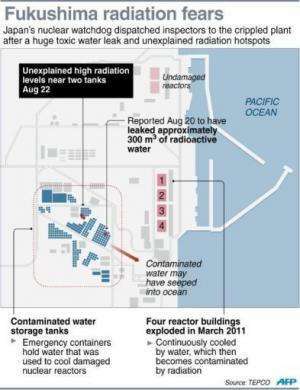 TEPCO has long struggled to deal with growing volume of now contaminated water it has used to cool the broken reactors. It said last week that some of the 300 tonnes that leaked from the tank could have made its way through drainage systems into the Pacific Ocean. That came on top of the admission that groundwater contaminated by water from the plant was flowing into the sea at a rate of 300 tonnes a day, taking its low-level radioactive load with it. TEPCO president Naomi Hirose on Thursday offered his apologies to fishermen who fear their livelihoods are being put at risk by contamination of the ocean, pledging every possible measure to avoid an impact on their catch. But Hiroshi Kishi, head of JF Zengyoren, a federation of more than 1,000 fisheries cooperatives nationwide, said his members had no faith in TEPCO's ability to fix the mess its plant had created. A TEPCO worker checks radiation levels around a contaminated water tank at Fukushima nuclear power plant, August 22, 2013. Japanese Prime Minister Shinzo Abe has promised to the world his government will play a greater role in stopping leaks of highly radioactive water at Fukushima. "We think your company's management of contaminated water has collapsed," he said. "We are extremely worried as it's creating an immeasurable impact on our country's fishing industry and will continue to do so in the future," he said. Nuclear Regulation Authority chairman Shunichi Tanaka told reporters his watchdog would begin to coordinate the fragmented information on marine pollution. "We are not in a situation at all that marine resources are showing radioactivity," he said. "However, we think we need to get a systematic understanding of the situation and provide the information to people, so the NRA is now starting to work on that."